Several months ago I had an idea for a necklace, bought the supplies... and promptly left them in a drawer. 'Til yesterday, when Alan Rickman died. I was fresh off writing a little Bowie tribute for Sunday Sweets, so the news of Rickman's passing felt that much more shocking, more brutal. We'd just been discussing Snape with friends at dinner the night before, and now, gone? Too many icons, too soon. 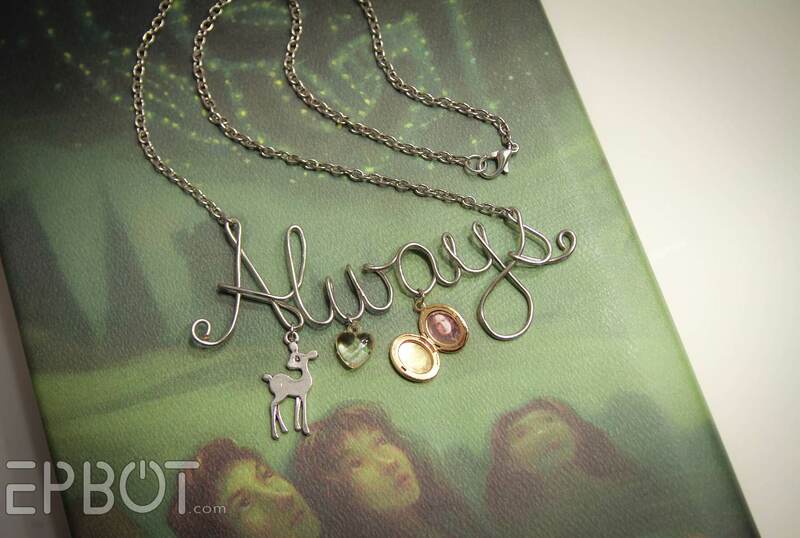 My Severus Snape tribute necklace. This was my first attempt at making letters with wire, and lemme tell ya: I have a whole new respect now for people who do it well. Like I said, this is my fourth one, and it still has plenty of small nicks and kinks. 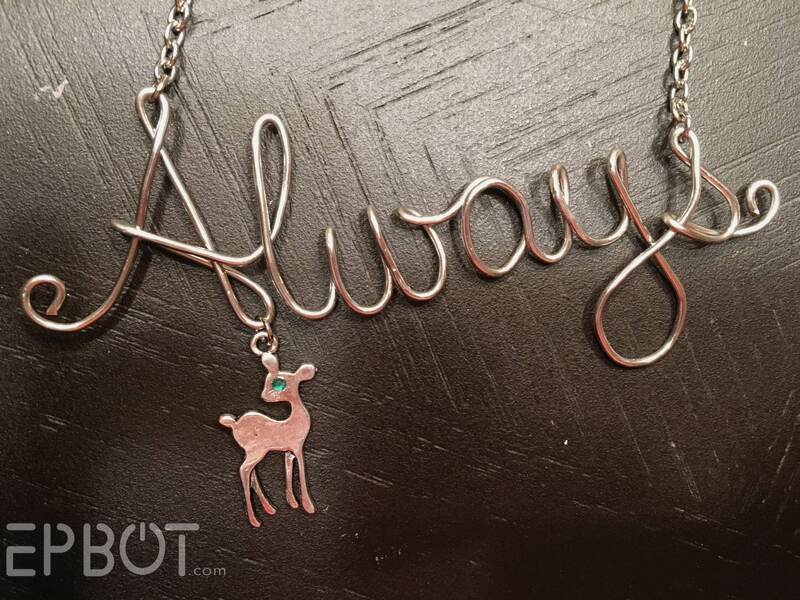 I think I looked at every doe charm there is online, and this was my favorite. Even better, you can get 12 from this Etsy seller for less than $3. Originally I was thinking of hanging a little potion bottle, too, but it was too cluttered. I also have a green crystal for the doe's eye, but it seemed too distracting with the other charms. Maybe if I make another one with just the doe? 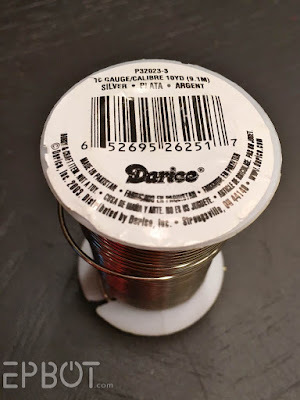 If you'd like to try this yourself, all you need are some small chain-nosed round-nosed pliers, a lot of patience, and a spool of jewelry wire that you can still bend a bit with your hands. I used 16 gauge, but that was almost too thick, so you may want something a little thinner. Start by writing out your word on a sheet of paper, so you can plan ahead where to curve and loop the wire. Then use embroidery thread to roughly trace your word to see how much wire you'll need. Also, I think that's my favorite photo. I like the shadow on the heart. I hope you guys enjoyed my little sad craft, and are maybe inspired to try your own. What beautiful necklace! I think you're right about not adding a potion bottle -- it would make it too cluttered. I, too, was very sad to hear about Rickman's death. His many roles touched so many. Am I a huge dork for crying as I read this and when I read "turn to page 394"; I cried harder? PS: The necklace is perfect! I would pay you to make me one. I don't have the patience. I was so sad to hear this news, but this necklace is an awesome and touching tribute. I have wanted to try the wire letters but have no patience for wire work. But so pretty! That's lovely. 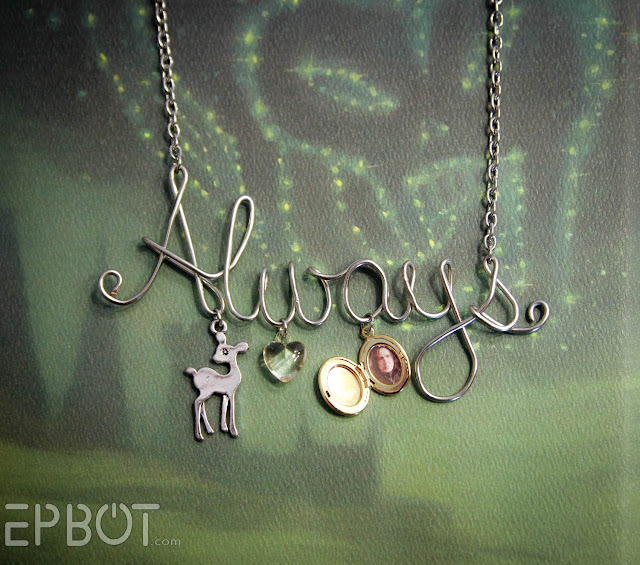 I may have to make one myself for my Potterhead dd. She spent last night watching as many Rickman movies as she could fit in. 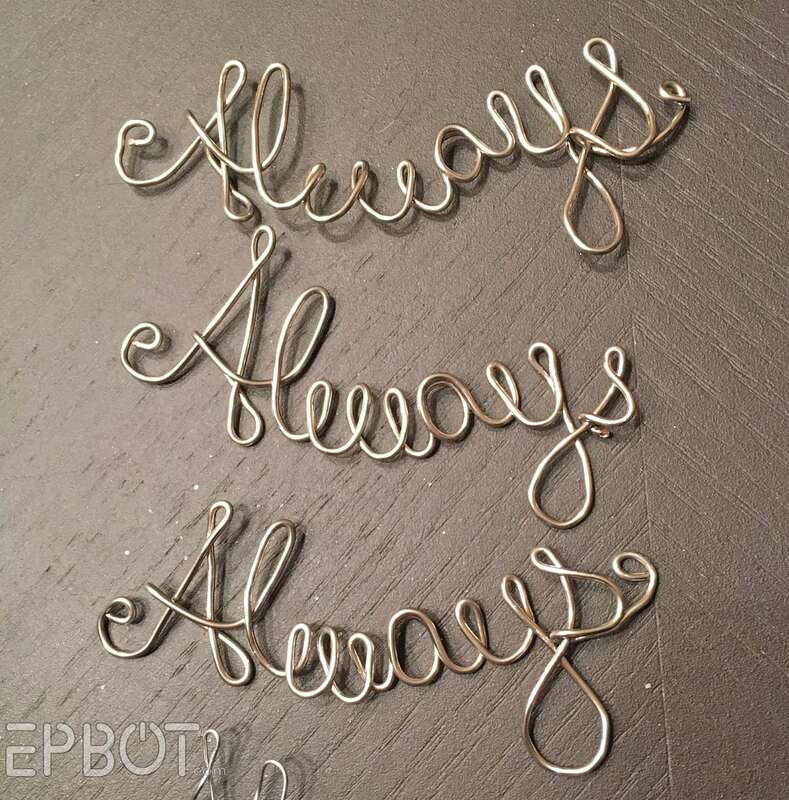 I used to do wire words many years ago when I was a scrapbooker. Yours is lovely and even though it is easier to use lighter wire (to a point. Light wire does kink easily,) I like the thickness of the wire you used in the design. It's perfect and lovely and... dammit, who's chopping onions in my office again??? I was stunned yesterday to learn of Alan's passing, and I thought of you and John immediately. I'll have to give this necklace a shot when the feels aren't so hurty. WOW, for only 5 tries, that looks spectacular! I'm never able to get wire to do anything. It's gorgeous Jen! 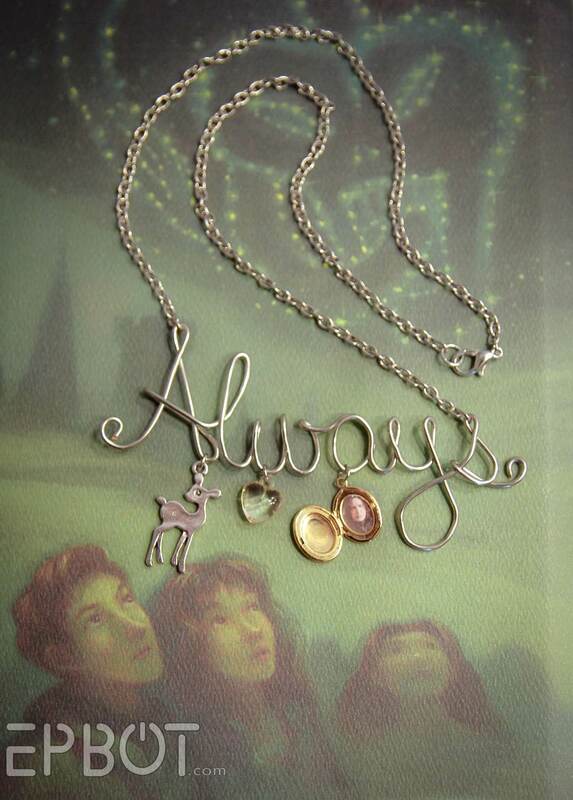 I was so sad yesterday and like you, I thought of wearing some Harry Potter jewelry today to pay tribute...and then I realized I didn't have any! What kind of HP fanatic am I?? So I might try making this or more likely, pick out a few of the millions on Etsy to purchase. I think the doe is adorable! Definitely hits right in the feels. Your next to last photo is the one with all the feels for me. It's hauntingly beautiful. Your post almost made me cry again, which would be bad considering I'm still at work. I like it with just the doe. Very simple and elegant. I neeeeed this. I am in the process of making a Harry Potter book-purse (I found the details at Instructibles.com. There are several to choose from. I used "How to make a purse/clutch from a Book" by grow_power). Perhaps I can make this a decoration of some sort, if it doesn't make it look too busy. I will post a pic when I'm done. I was so sad to hear of his passing, although for me it was Sense and Sensibility and Truly Madly Deeply that made me a Rickman fan. I watched Galaxy Quest last night in tribute. That said, this is a lovely way of remembering a, from all accounts, lovely man. Fantastic job! That is beautiful! A wonderful tribute to an excellent actor; he will be missed. May I suggest, the wire you used can be difficult to work with, if anyone wants to try I highly recommend Artistic Wire or Beadalon. 18 gauge would be a good thickness to try. If you want less nicks you can lightly file the edges of your flat or chainnose pliers to round them off ever so slightly or get nylon jaw pliers. Awesome tutorial as usual, thanks! Not gonna cry, not gonna cry...damn it, if that isn't a losing battle, I don't know what is. Very nice. I like the simplicity of the single doe charm as well. Your letters came out very nicely in the end. Fitting. That is so lovely! You are so talented! Thank you for everything you do, but especially this. Jen, this is nothing short of spectacular. I'm amazed that was your first time making something like this. Beautiful work and a wonderful tribute. Simply lovely and a touching tribute to a talented man. This has inspired me to do a spoon with a heart punched out of it as an ode to his role in Robin Hood. A wonderful actor, gone so soon. Love the necklace Jen. MAJOR kudos to you for making letters out of wire. Tried it once and never again. LOVE this. 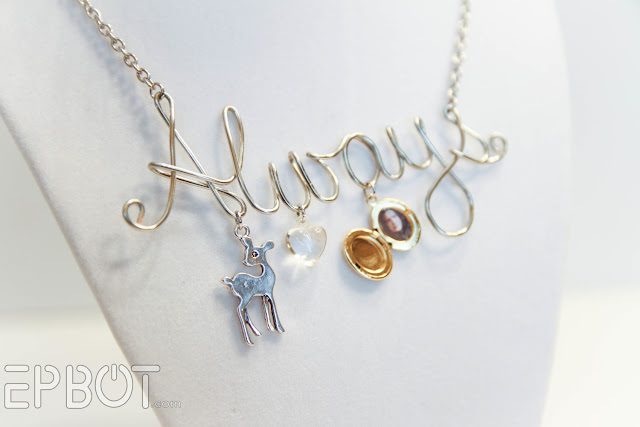 You picked exactly the right charms, and I love the shots with it on HBP - which coincidentally is my favorite of the seven! A beautiful tribute to a beautiful man. Beautiful and fitting tribute. Just as a clarification to make this project easier for newbies, chain noise pliers are actually the needle nose pliers with no teeth/serrations. The round nose pliers are called, funnily enough, round nose pliers. Also, people should stick to copper core craft or German wire. Aluminum is way easier to work with, for sure, but it will not hold up to being worn. 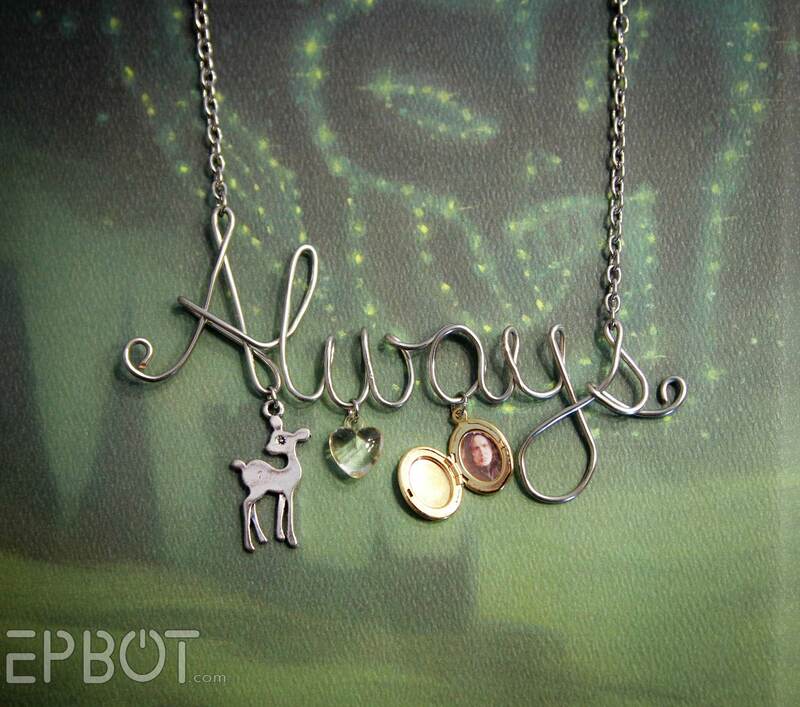 Beautiful necklace, and the charms are perfect. I may have to try making wire letters sometime soon. Also, putting some masking tape on the pliers tips helps to avoid making marks on the wire. Ugly crying right here! 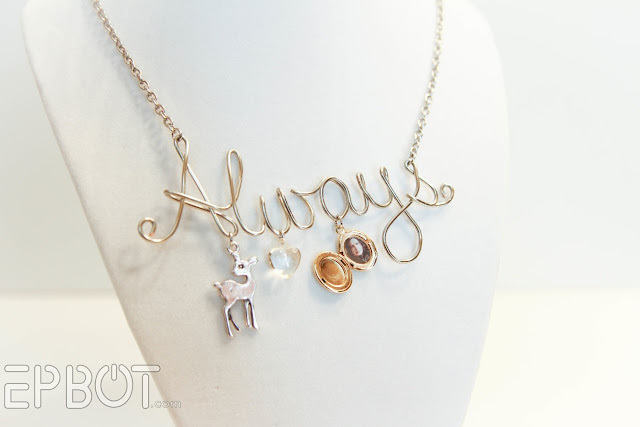 This is beautiful and while I am not quite as crafty as you in the jewelry department, I am going to try to make this through my tears. Waaaah! Thanks for sharing! Beautiful work, Jen! And such a lovely tribute. I'll get my tissues ready for the Bowie Sunday Sweets tomorrow. Both these guys are going to be sorely missed in this household, too. Gorgeous tribute, Jen. I watched Truly Madly Deeply yesterday with the requisite box of Kleenex (more so because I also play the cello and have had to put it "in the case" several times in recent years because of my own battles with illness). I think I may need to watch Galaxy Quest today. I've shown Something the Lord Made (an HBO movie with Alan Rickman and Mos Def) to my bio and anatomy classes for years. It has become one of my favorite Alan Rickman movies. Love it. Some of my students were so sad. I shared your blog post with them. They loved it. I've been crying all weekend over the sad passing of Alan Rickman. I watched Sense and Sensibility last night, using up a lot of tissues. There is a Harry Potter marathon viewing of all films coming up, no doubt there will be more tears. I didn't expect to be heartbroken over the death of an actor - but there it is. 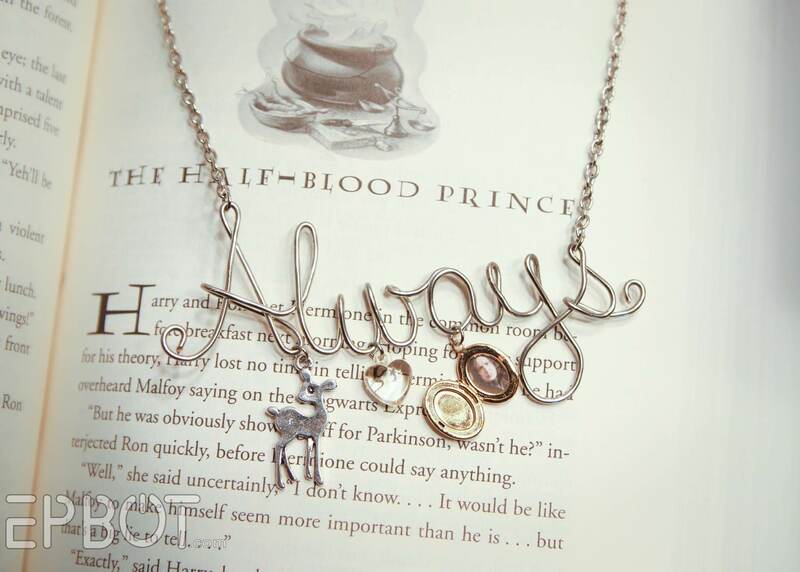 It's a beautiful necklace and a very beautiful tribute too. I was thinking that maybe just the doe and the potion bottle for the subtle reference. I am going to miss his voice most of all. My favorite actor...your necklace....amazing. Here was an actor who did more with a single hand gesture or glare than 9 pages of dialogue to express the inner torment of the character. Thank you, Alan Rickman, thank you. It's beautiful and a wonderful tribute. oh, jen. wow. this is beautiful. and perfect. Gorgeous. Amazing. What a beautiful tribute. Just wow! You are so amazing Jen! And I think if you do another for the doe with the green eye, you should totally have a potion bottle on the end of the word.